Dropping behind Manchester City in the title race, Liverpool need to keep winning to ensure there’s no let-up for the leaders. Due to some recent patchy form Tottenham have dropped out of the title race, but remain the most difficult opponent in Liverpool’s run-in. Jurgen Klopp set up his side in their usual 4-3-3 formation, whereas Mauricio Pochettino opted for a 3-5-2. Tottenham attacked directly. Joel Matip and Virgil van Dijk were sticking very tight to Harry Kane and Lucas Moura, however them sticking so tight to the forwards opened up some space for runs from Spurs’ midfielders. Spurs could play a long ball forward, have the forward lay it off to Christian Eriksen under pressure then Eriksen could play a through ball to the onrushing midfielder. This looked like it could catch out Liverpool a few times early on, not helped by a nervy start from Alisson Becker, but the centre-backs generally dealt well with the long balls and Spurs didn’t offer much else. It’s not really much of a surprise the Jordan Henderson, Georginio Wijnaldum and James Milner midfield trio started here. It’s probably Liverpool’s best pressing midfield and Klopp would have expected a battle against Pochettino’s side. It lacks creativity through the middle though, with one of Alex Oxlade-Chamberlain, Naby Keita or Xherdan Shaqiri really needed to provide a spark, Liverpool often resort to endless crosses from wide. Spurs played into Liverpool’s hands though. Their back three would have made more sense had it been an attempt to push the wing-backs forward and play down the flanks, avoiding Liverpool’s pressing in the centre, however, as Spurs would just hit the ball long when they won it, Danny Rose and Kieran Trippier stayed deep. 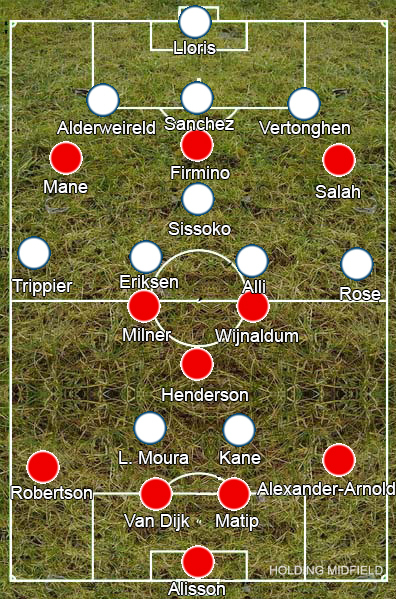 Liverpool quickly worked out that they could drag Spurs to one flank then switch play to the other and their midfield three wouldn’t be able to cover ground in time, leaving the full-backs in plenty of space to pick out a cross. Milner joined Robertson out on the left too, doubling up on Trippier to win his teammate even more space. Roberto Firmino also frequently dropped deep in the centre, receiving the ball in the gaps between the midfielders then spreading it wide to the flanks – Spurs’ defenders were initially reluctant to follow, and when they did Liverpool would look to attack the space they had left with long balls in behind for the forwards. Liverpool took the lead using the space afforded to the full-backs. They won the ball back from a long ball on their right, then spread the ball out to Robertson on the left, who had the time to drop a cross straight onto the head of Firmino as Sadio Mane keeps Trippier busy. Allowing Liverpool to have the ball out wide can be quite effective despite their full-backs’ quality crossing because their forwards are quite small, so most centre-backs can win crosses against them. That requires better defending than Spurs offered here though. Davinson Sanchez is initially keeping track of Firmino until the Brazilian moves into his blind spot. 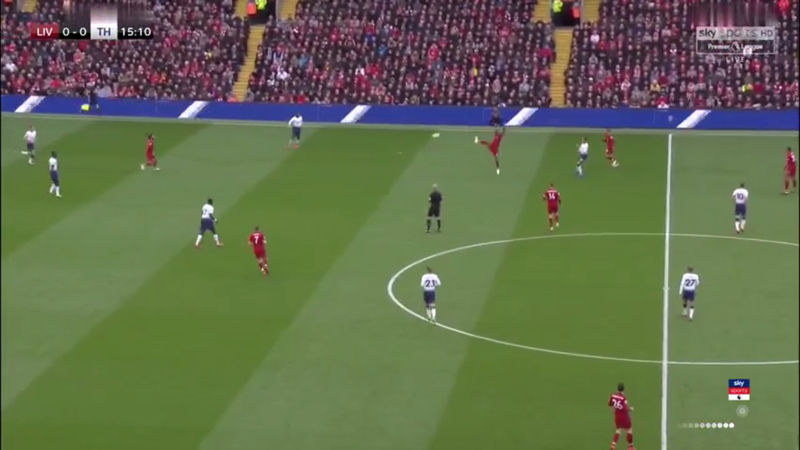 From there, it’s difficult to work out what he’s doing: has he left Firmino to Jan Vertonghen, but poor communication means the Belgian doesn’t come across, or is he aware he’s still meant to be marking Firmino and just loses track of him due to him not checking his shoulder? Either way the ball sails over Sanchez’s head to Firmino waiting to finish. Liverpool continued to threaten down the flanks throughout the half, and at half-time Spurs changed to a 4-4-2, with Rose pushing up into midfield and Vertonghen moving across to left-back. This left Spurs’ midfield less stretched, enabling them to engage with Liverpool higher up the pitch. It didn’t allow Spurs to take control of the match, but it did make it more equal, stopping Liverpool from attacking at will even if Spurs didn’t really create many clear-cut chances of their own. With twenty minutes remaining, Spurs equalised. Kane took a quick free-kick, spreading the ball wide to Trippier. Liverpool were caught napping as Spurs swarmed the box and Lucas Moura finished. Knowing they really needed three points to keep the pressure on City, Klopp made a double substitution, bringing on Divock Origi and Fabinho for Henderson and Milner as Liverpool went to a 4-2-4. This gave Spurs more opportunity to break from midfield, but it also put more pressure on their defence. Liverpool still struggled to create proper chances, yet continually won set-pieces, and eventually got a winning goal in the last minute with a freak own goal.